Went out Thursday in our early muzzleloader season here in Maryland. I got to my stand around 2 for the afternoon hunt. I got settled and thought I should get a snack before I settle in. I have four Fig Newtons I'm going to eat. No mask on, no gloves and gun hanging on holder. I start on Newton #4 and a deer appears out of nowhere below my stand, I freeze and she walks in. When she turns away, I am able to get my mask up, gloves on and gun at ready. That took a while because she kept looking everywhere as they do. Now another doe, then two more. One is huge! One of the biggest does I have seen this year. After awhile, I am prepared for the shot as a smaller doe was in front of her and finally moved. As I am about ready I keep waiting for a small doe around 7-10 yards from me to look the other way. Instead she looks straight up at me and stares. Finally she blows and they all take off! So I settle back down and one of the smaller ones comes back, feeds, then leaves. So I settle in again. Around 20 minutes later another deer comes in from a different direction and I watch her feed for awhile to see if I want to take her. As she finally begins to leave, I ask myself the ultimate question. 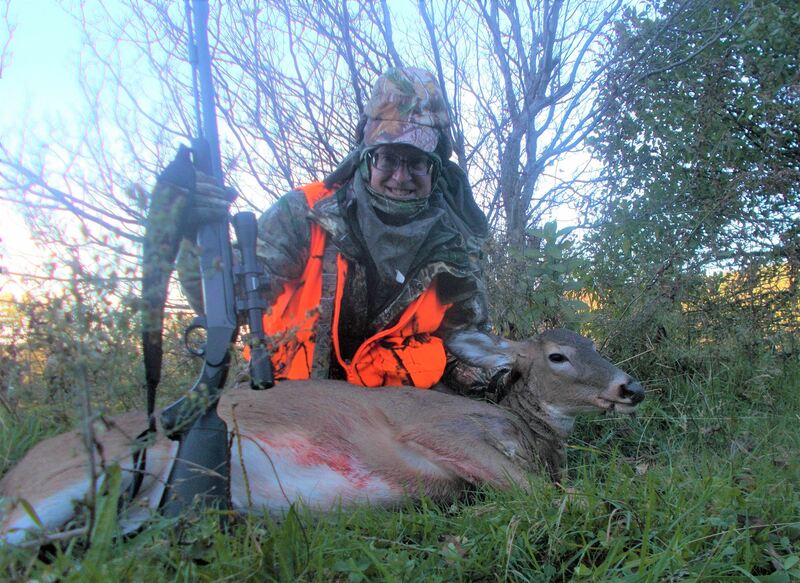 If the season ends with no deer in the freezer, will I regret not taking the shot? I have said no to this question many times this year on very small does. But my answer this time is yes, so I pull the trigger. She jumps and takes off. I go the site of impact and blood everywhere and begin following a large blood trail. She follows a four wheeler tail for around 2o yards then turns into a large field with tall grass. I continue to follow the blood trail another 30-40 yards and there she is, all crumpled up. Backstraps on the grill again!! Good job, Bearclaw! Fresh venison is always good! Our ML season doesn't start till December. 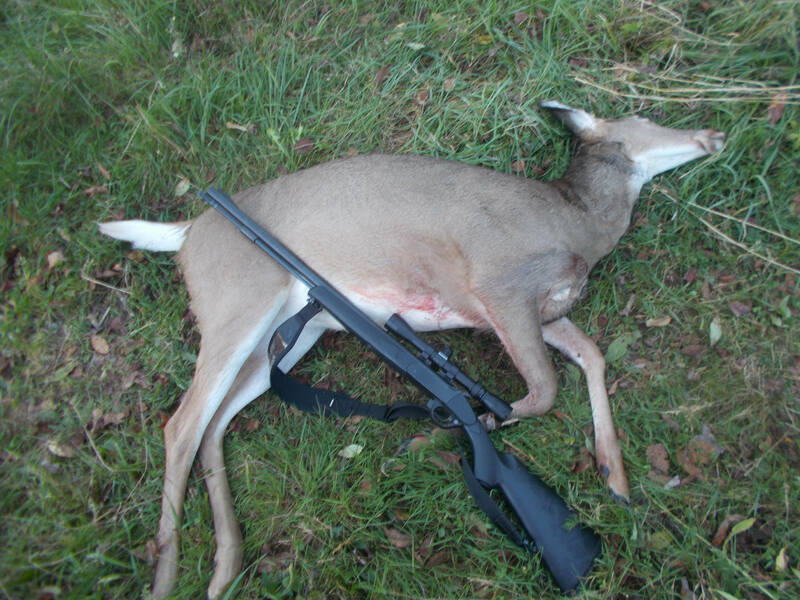 Of course, you are allowed to use the ML during the regular firearm season, and the late doe season. Congrats on the doe . Congrats Bearclaw. Very nice doe!! Congrats on the fine doe, you should have many good meals in your future. I'm going to check and see if fig newtons are allowed to be used as bait in MD. Our early ML season ended on Saturday in PA. It was a good season for many of us also. Congrats!! Nice doe good shooting!! Congrats!! Good Luck with the rest of your season. Early start on filling the freezer....Save some room for your buck. Thanks everyone! I appreciate your comments!